After the success of building such a great looking Superman parade balloon (check it out here), Big Events wanted another challenge. We figured we would try to outdo ourselves with a GIANT BATMAN parade balloon. Over five stories tall and three car lanes wide, it’s done! Take a look at the photos, how does this look? We at Big Events are a bit biased, but after seeing this fully inflated with helium and floating for the fist time, our response was (and still is): Supercalifragilisticexpialidocious!!!!!!! Again we don’t mean to be biased but this looks spectacular. 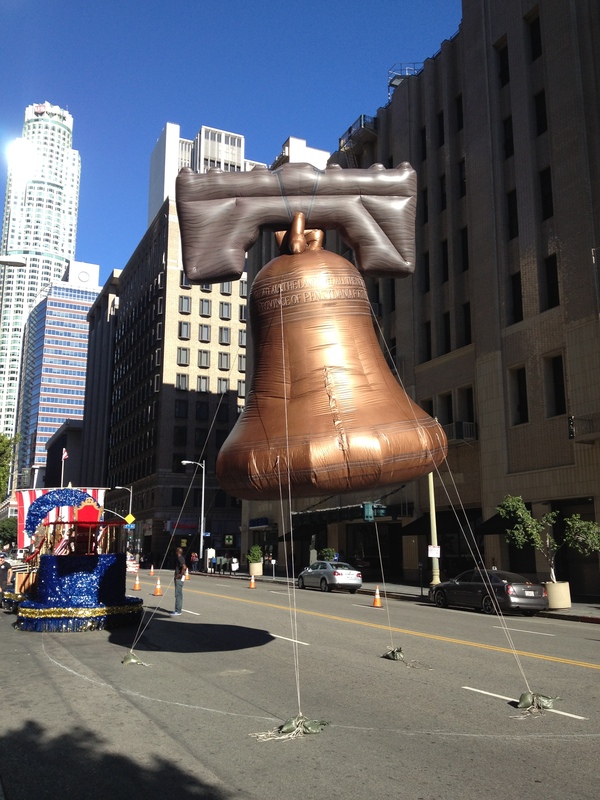 Hope you get to see it in person because this parade balloon is HUGE. Just look at how small the people are. Our inflation system for all parade balloons is helium conscious. What I mean by that is we use an algorithm to calculate the amount of helium needed to fly so as not to be wasteful of the precious resource. That being said, this Batman balloon takes almost 6,000 cubic feet of helium to fly. The complete volume of the balloon is much more that than, but that is what we need to get him off the ground. Rolled up to ship it weighs 275 pounds. That’s a whole lotta Batman. We update our facebook page daily. Visit our page to take a look at some of our recent projects. You won’t be disappointed. Tailgating. The tradition that is unequivocally just as important as physically attending a sporting event… is dying. The two go hand in hand like mac and cheese. Over the last couple decades there has been a push to build these behemoth billion dollar venues in populated downtown areas, inadvertently killing the long standing tradition of tailgating. When a stadium can hold 60,000 + people, but only allow for about 1,000 of those spectators to park in a lot, the tradition is all but gone. At Big Events, we can feel good about having a part in the tailgating world as there is no better beacon or call to attention than having a giant advertising inflatable or advertising balloon float above a sea of cars and bbqs. These stand out and are a great way to let the fellow tens of thousands of parked tailgaters know who you are and what team you supporting. Be seen and get known. We can only hope the tailgate tradition stays alive and continuous to be a part of the spectators sporting world. Check out pictures from some of the awesome projects we have worked on recently. This looks like a job for… Big Events?!?! 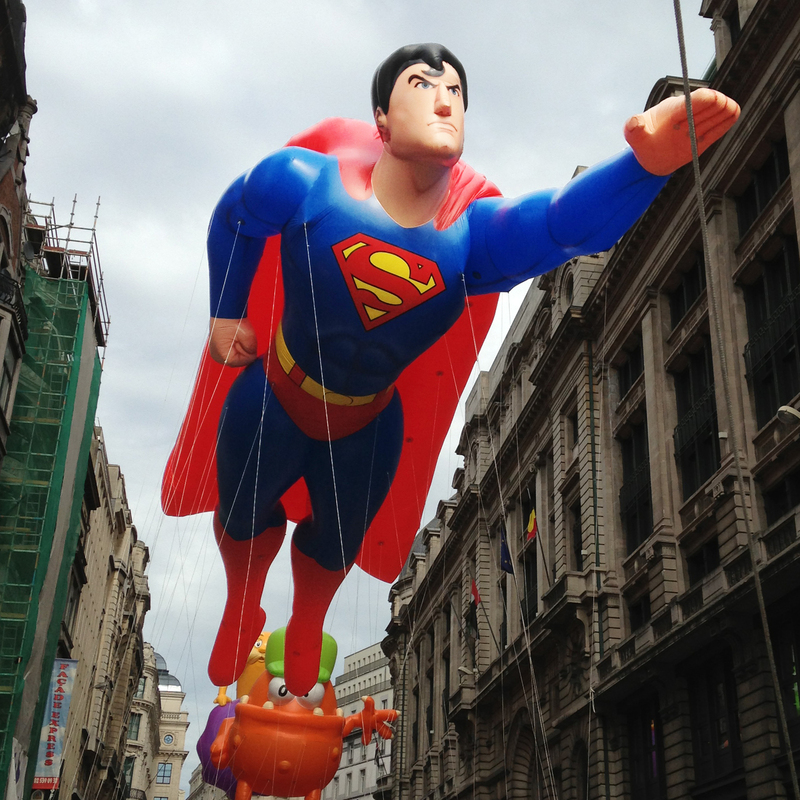 We continue to set the bar with our parade balloons and the 2013 Balloon’s Day Parade in Brussels, Belgium added another first for Big Events, the introduction of Superman. At 65’ long, weighing over 200 pounds, this helium parade balloon may not be made of steel, but it is definitely the next best thing. 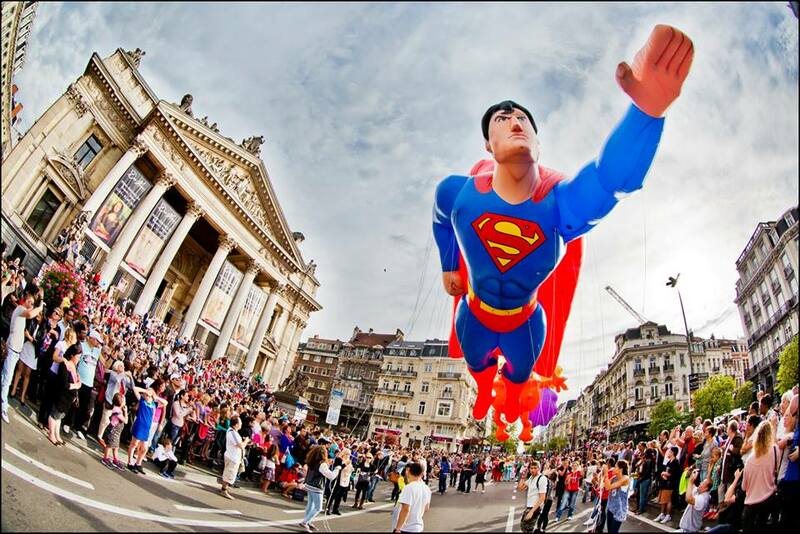 Superman traveled all the way to Belgium to make his unveiling and it could not have been a more perfect day as it flew through the city streets. Europe looks to be embracing one of America’s oldest traditions as the attendance climbs and climbs at this balloon parade once a year. Notching up its fifth year in a row, the streets were lined with onlookers and they were in for a treat as Superman dusted his cape off to greet the city of Belgium. We update photos almost daily at facebook. Visit our page to take a look at our most recent project. Below are a couple more shots from the parade. When Dr. Jorn Hurum with the University of Oslo Natural History Museum unearthed the largest Pliosaur fossil of its kind roughly 800 miles from the North Pole, he contacted Big Events to create an inflatable replica to show everyone just how these would have looked on a lifelike scale. Stacked with decades of his copious research and his newly found fossil, we worked closely with him on every aspect of this special inflatable. It had to be exact! Well, as exact as what we think these creatures looked like 150 million years ago. Through countless correspondence the final product was received so well it has been used in National Geographic documentaries as well as displayed in many different places around the world, even with a blessing from the King of Norway. Check out a quick edited video with graphics of the inflatable in a National Geographic Documentary. This is probably the closest any inflatable has ever been to the North Pole. It was flown straight to the dig site to help the team get a full understanding how large these Jurassic marine reptiles really were. The full documentary can be seen at here. It’s a great watch if you have the time. .
Big Events has been known for their attention to detail on all our products. Inflatable dinosaurs can be some of the most time consuming inflatables to produce because of their shape, skin and colors. Airbrushing by hand every single scale on a giant inflatable takes quite a bit of time. Advertising inflatables can be cheap and ugly, or they can be exquisite, clean and professionally done. Our dinos are just the tip of the iceberg with what we have created in our San Diego County warehouse. Check out some recent projects on our facebook page. Dubbed as the largest balloon parade in the United States, the Port of San Diego Big Bay Balloon Parade which is associated with the Holiday Bowl has more parade balloons in it than any other parade. Yes, even more than the Macy’s Day Thanksgiving Parade. Big Events has been the sole supplier of helium parade balloons to this parade for a number of years. With its seasoned, well experienced and well-traveled staff, we can typically pull off inflating 25 to 30+ gigantic parade balloons in just a couple hours. Big Events’ helium parade balloon system has been refined for over 20 years, giving us the know-how to successfully pull off a great feat such as the largest balloon parade in the U.S. year after year. In addition to this, our systems allow us to deflate these balloons much faster than and other system in the world. This is extremely important in the case of inclement weather. Operating a 60’long dinosaur or 60’ tall Cat in the Hat requires careful and extreme focus. Dodging street lights, trees and the occasional electrical wire takes years of experience. I liken it to operating a sail boat with no keel. Even the softest breeze can push these all over the place. The film industry is unlike any other organization on the planet. Direction, concept and logistics all need to be planned out months in advance for clients to sign off on hundreds of thousands of dollars in production costs, yet every time we work on a project for film, there are never any logical realistic time frames given. It is an odd Catch-22 that has never made sense to me but works for this group. Below are only a few examples of jobs Big Events have been part of over the years, it is amazing the amount of work that go into these projects for only a second or two or air time. 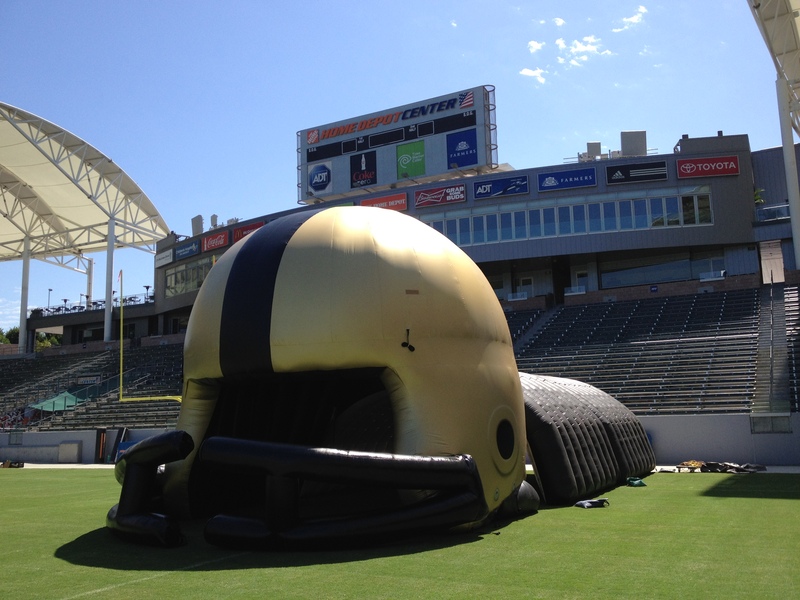 This HUGE inflatable helmet for a Capital One Commercial was designed and skinned gold in just under a week (we had a pre-existing helmet that we tore apart and rebuilt with their custom specifications). That is a ton of work in a very short time frame. 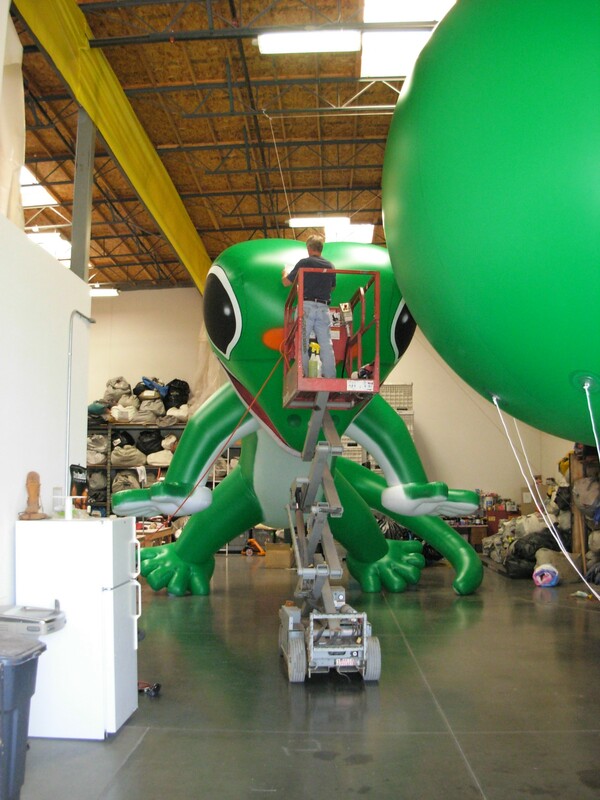 This Gieco Gecko balloon had just a bit more production time allotted, but custom building a giant balloon usually takes 4 weeks. This project only had allowed us 2 to 3 weeks… and we built two. Different sizes for different potential shots. Here are more pictures of the commercial shoot. Sometimes, when our luck is running high, we can rent an existing item, which was the case for this 2013 Budweiser Super Bowl commercial. Only certain people have the nerve set to work with this industry and Big Events is no stranger to this. What was not mentioned above, is the fact that these companies will call 5 to 10 times a day with potential changes. Compounded with their short time frames, these jobs can be intensely stressful, but extremely rewarding. Check out our facebook page for more pictures of our balloons. Our youtube page is another great way to see how our balloons have been used in commercials and movies.